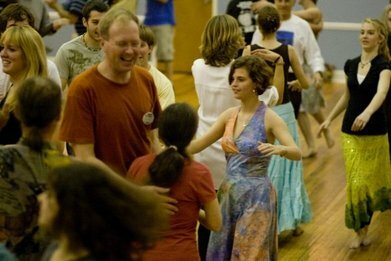 Contra dancing is social interaction, meeting people, and making new friends, set to music. 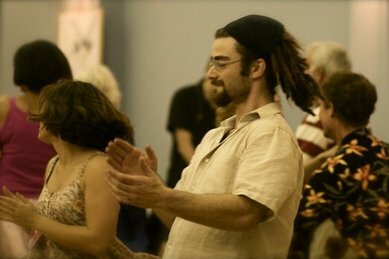 A caller, usually working with a group of live musicians, guides new and experienced dancers alike through a variety of dances. Contra is danced to Celtic, Quebecois, Old Time, New England, Southern Appalachian, Jazz, Blues, and all sorts of other music played by live bands. In a contra dance, parallel lines of dancers stand opposite -- or "contra to" -- their partners. A dancer and his or her partner form a couple. A dancer and his or her partner dance a series of figures, or moves, with each other and with another couple for a short time. They then repeat the same figures with another couple, and so on. The figures are similar to those of old-time square dancing. The figures are combined in different ways for each different dance. Worried About Being New At This? Don't be. You are in good company -- we were ALL new to Contra at one time. 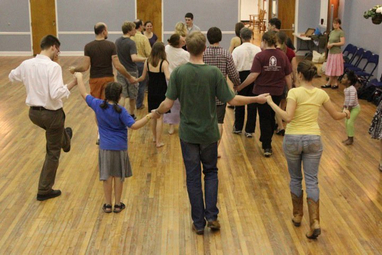 Beginners are always welcome at Charleston Folk dances; prior experience is not expected. We offer a Dance Basics workshop before the dance on Fridays and are always happy to help. The most important thing is to have fun! So grab your dance shoes and come on over for your first (or second, or seventieth) dose of dance trance!